Mixed media presents all sorts of opportunities for artists to express their ideas by incorporating a wide range of materials into their artwork. Typically, we think of mixed media as a technique that combines art materials, such as mixing acrylic paint with oil pastels, enhancing photographs with colored pencils, or creating collages from all sorts of paper. Many mixed media artists have expanded beyond the traditional artistic medium to incorporate found and recycled objects or natural materials like eggshells, feathers, bark, and even soil to create unusual effects and textures in a piece. Mixed media has played an important role in the development of modern art as leading artists like Marcel Duchamp, Robert Rauschenberg, and Jasper Johns mixed their media to push the accepted boundaries of painting and sculpture. Perhaps the most famous – or infamous – mixed media artist is Damien Hirst, who used expired critters in his art! That’s a bit much for me, but I do appreciate how “mixing it up” creates artwork that offers fresh perspectives and gets us to expand our view of art and its relationship to the world. Quite a few of the artists who exhibit with Paradise City are masters at the craft of mixing media. Here’s an introduction to some of my favorites. 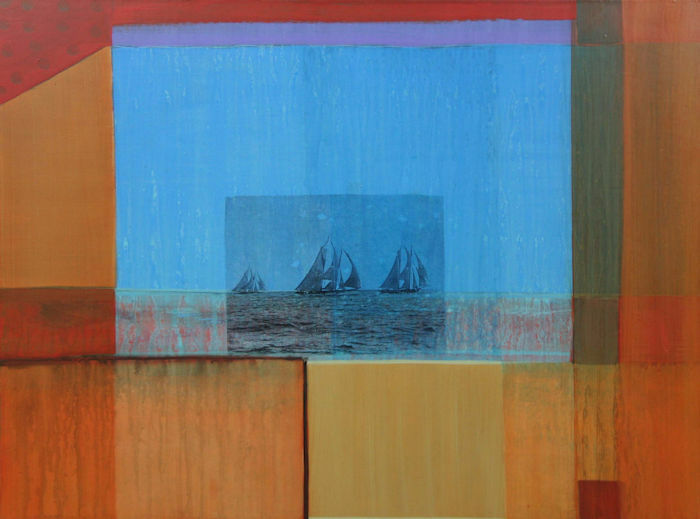 Laurie Goddard’s “Night Riders” combines acrylic paint with photographs and other materials to create a ghostly image of ships racing across the sea. Laurie describes herself as a process-oriented artist, using materials in unconventional ways. Her favorite material is encaustic, which consists of hot wax to which colored pigments are added, combined with water-based paints and varnishes, nautical charts, photographs, oxidized metal leaf, graphite and charcoal. Laurie has become adept at combining disparate materials such as metal leaf and water-based paint which normally cannot easily work together. She has learned to push the limits of these materials to create highly original effects in her paintings. Goddard achieves richness and depth in her abstract paintings by using multiple types of art materials in each piece. For Pat Littlefield, the path to mixed media art began with a fascination with fiber. Her experimentation and study of weaving and fiber work eventually led her to trying her hand at papermaking. Today, she focuses her artistic efforts on creating art pieces that combine her hand dyed and painted canvases with all sorts of natural materials such as feathers, bamboo, and quills. 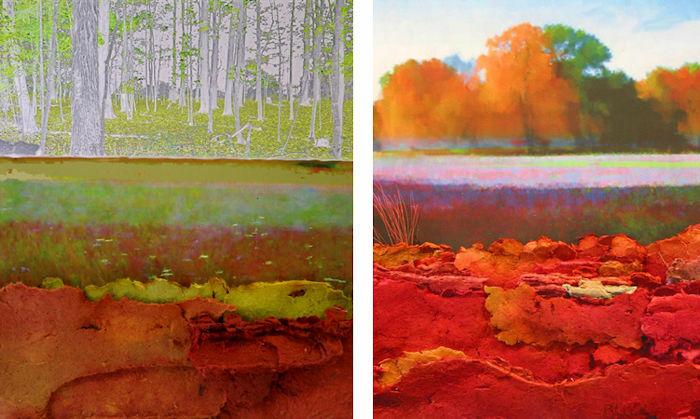 In many cases, Pat’s pieces begin life as a digital photograph which she then combines with handmade paper. Pat’s papers are primarily made from abaca, a plant similar to the banana plant. She beats the abaca to a pulp, dyes it, and then forms a piece of paper by layering up different colors of pulp. Twigs, reeds, tampico grass, muslin, and other materials are sandwiched between the layers to add texture and depth. 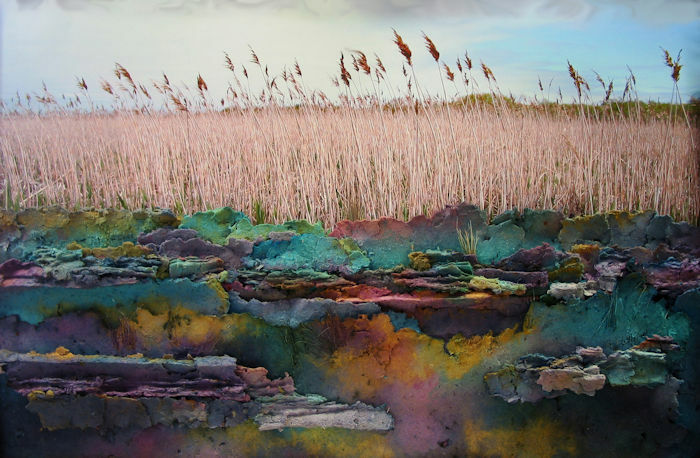 Pat Littlefield combines digital photography with hand-made paper and natural materials to create her visions of the natural world. Pat uses her work to share her delight in the world around her with others. She appreciates how mixed media enables her to interpret mountains and sky, Western buttes, adobe architecture, garden flowers, and forests in shadow and light in unique and unusual ways. ” My hope is that each piece gives others a lifetime of pleasure and thought-provoking observation,” she says. 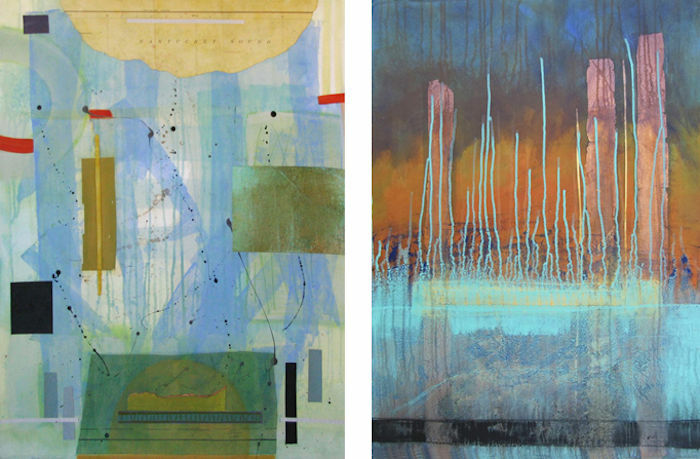 Littlefield focuses on reinterpreting the natural and manmade world around her through her mixed media paintings. Of course, mixed media is by no means limited to just paintings. Many sculptors and craft artists are enjoying the process of using multiple types of materials in imaginative ways as well. David Winigrad uses mixed media to explore an old folk-art form, the whirligig. His work is a contemporary reinterpretation of this most uniquely American art form, creating what David refers to as “kinetic wind sculptures.” The basis for most of his sculptures is a variety of American and exotic hardwoods combined with all sorts of other materials including brass, glass, coral, and bone. Like the traditional whirligig, David infuses a sense of whimsy and charm into his pieces. 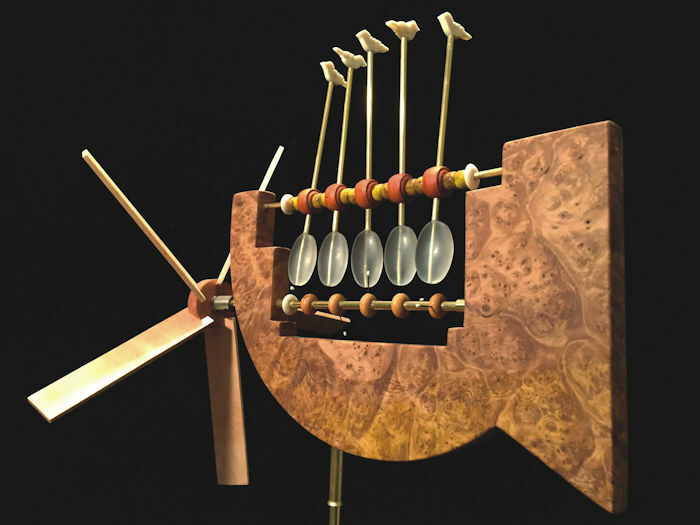 One of David Winigrad’s “Pendulum” series, this whirligig is made of wild almond burl, maple, glass, bone, and brass hardware. See it in action on YouTube. Mix It Up with the Artists at Paradise City! The upcoming October Paradise City Arts Festival provides a terrific opportunity to meet Laurie Goddard, Pat Littlefield, and David Winigrad to learn more about their mixed media techniques and see their work up close. In addition to these talented artists, the October festival features hundreds of artists and crafts people working in all sorts of media including photography, metal and stone sculpture, glass, wood, leather, fabric, and jewelry. The October festival takes place October 6-8 at the Three County Fairgrounds, 54 Old Ferry Road, Northampton, MA. For more information on the show, including hours, location, admission, and exhibitors, click here or buy tickets online.